I�ve been printing a lot of photos lately. My printer is an Epson Photo Stylus 890 that I got a couple of years ago. It delivers gorgeous results, but I�m saving up for a replacement: Epson�s $1799 Stylus Pro 4000. Now that I�m shooting 5- and 8-megapixel images, I want a large-format printer, and the Stylus Pro 4000 can print a borderless 16- by 20-inch print. Sweet. The Stylus Pro 4000 has another big advantage: it uses pigments instead of dyes, and therefore, its prints have a much longer lifespan. If you do a lot of inkjet printing, the truth behind print permanence can be depressing. Here with more details is, well, me. Here�s an excerpt from the iPhoto section of The Macintosh iLife '04. After all the effort you put into making inkjet prints, it may disappoint you to learn that they may not last long. Many inkjet prints begin to fade within a year or two -- or faster when displayed in direct sunlight. Some printer manufacturers now offer pigment-based inks and archival papers that last for decades, but pigment-based printers are pricier than the more common dye-based printers. If you have a dye-based printer, consider using a paper rated for longer print life. Epson's ColorLife paper, for example, has a much higher permanence rating than Epson's Premium Glossy Photo Paper. Drying time. Allow prints to dry for at least a few hours (preferably 24) before framing them or stacking them atop each other. For long-term storage, consider using acid-free sleeves designed for archival photo storage. Don't skimp. Finally, avoid bargain-priced paper or ink from the local office superstore. Print preservation guru Henry Wilhelm recommends using only premium inks and papers manufactured by the same company that made your printer. Is all this necessary for a print that will be tacked to a refrigerator for a few months and then thrown away? Of course not. But when you want prints to last, these steps can help. To learn more about digital printing, read Mastering Digital Printing: The Photographer's and Artist's Guide to High-Quality Digital Output, by Harald Johnson. Check Out Video and PDF Excerpts of "The Macintosh iLife '04"
It's shipping! Amazon.com is finally shipping The Macintosh iLife '04. To celebrate, I've published some video clips and PDF excerpts from the book. Check them out and learn more about this one-of-a-kind, full-color book and two-hour instructional DVD hybrid. If you've received the new book, drop me a note and let me know what you think of it. And stay tuned. Now that the book is out, I'll be revising and updating the rest of this site, adding a GarageBand resource page and much more. Lost in the Jungle: Frustrations with Amazon.com, and Announcing the Teacher's Edition of "The Macintosh iLife '04"
It's been a hectic week of deadlines, with more to come. But I did want to dash off a quick dispatch to address what has become a frequently asked question: When is my book coming out?! The good news is, it's out. The bad news is, Amazon.com says it isn't. The world's largest virtual bookstore is still saying "this item has not yet been released." According to my editors at Peachpit Press, Amazon has been plagued with problems with its database system. I saw evidence of this myself over the last couple of months: on my book's page, the title was wrong, the page-count information was wrong, and there was no descriptive copy. Those problems appear to be fixed, but the bookselling giant is still saying the book isn't available. One option is to order the book from Peachpit Press. Peachpit's price isn't quite as good as Amazon's ($26.99 instead of $20.99), but Peachpit is claiming that the orders ship within 24 hours. And now, an Apple for the teacher. While we all wait for Amazon to get its act together, I'm happy to announce a special edition of my book. 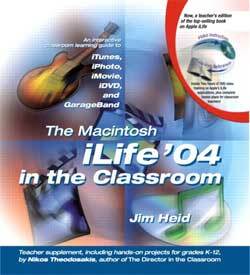 The Macintosh iLife in the Classroom is a special edition of my new book and DVD aimed specifically at K-12 educators. The teacher's edition is identical to The Macintosh iLife '04, but has a special sections at the front and back of the book written by filmmaker and educational consultant Nikos Theodosakis. Nikos selected and adapted ten award-winning lesson plans from Apple's iLife Educator contest and describes them in a 72-page section that appears at the end of the book. The front of the book contains a 24-page essay that provides great background on the how and why of using digital media in education. The classroom edition of the book includes the same DVD that accompanies The Macintosh iLife '04 -- two hours of instruction featuring yours truly, plus utilities, AppleScripts, GarageBand loops, and much more. Now here's the weird part: even though the classroom edition has roughly 100 pages more than The Macintosh iLife '04, its price is exactly the same. Hey, I just write 'em -- I don't price 'em. If you're a teacher and you're heading to the National Educational Computing Conference in New Orleans this month, stop by the Apple booth for a free copy of my book's classroom edition. You can read the details in the June 2004 edition of Apple's eNews for Education. The bottom line. To sum up all this madness: The Macintosh iLife '04 is done and available, no matter what Amazon says. And The Macintosh iLife in the Classroom will be available in about a week. Its roughly 100 additional pages contain lesson plans and tips for using iLife in the classroom. Got all that? If so, you're ahead of me. Now have a good weekend. Today: a blast from the past. I've been slowly but surely scanning thousands of old negatives and slides using a Minolta film scanner. I wrote about this subject in a recent Macworld, and I expand on the topic in the latest edition of my book. 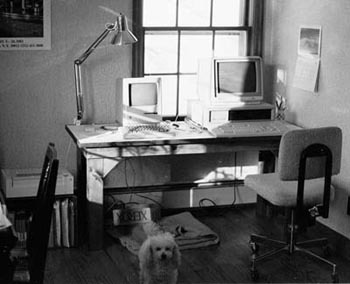 I recently scanned the following photo, which shows my home office in early 1984. On the left is, of course, a 128K Mac; an ImageWriter printer is on the far left. My external floppy drive hadn't arrived yet. On the right is some bizarre Texas Instruments MS-DOS computer that had a built-in voice-recognition system. You had to wear a headphone-type mike and spend hours training the computer, and it still didn't work. I was reviewing it at the time. (In early 1984, I was senior technical editor of Kilobaud, one of the first computer magazines.) If memory serves, I panned it. In August 1984, Kilobaud (then renamed Microcomputing) folded, and I began freelancing and writing for Macworld. And at the risk of sounding like the old fogey that I suppose I am, that pretty much takes us up to the present. We've lost a unique voice: the great Ray Charles has died at age 73. Two quick nuggets from the Department of Troubleshooting. Share big. One concerns iTunes 4.6, and it comes from Dan Frakes at MacFixit, who writes, "iTunes 4.6 fixes the bug where you couldn't share iTunes Libraries with more than 28,899 tracks." iTunes 4.5 had a bug that prevented the sharing of truly mammoth music libraries. MacFixit has more details about the bug fix. DVD compatibility. Over at Macintouch, a couple of readers have complained that DVDs they've authored in iDVD 4 and DVD Studio Pro 3 do not work in Mac OS 9 systems. I've confirmed this myself -- OS 9.x displays an error message when you insert a disc authored in either iDVD 4 or DVD Studio Pro 3. As it turns out, I'm in the process of reviewing DVD Studio Pro 3 for Macworld, and I had the opportunity to speak with its product manager this morning. Both programs share the problem, he said, which deals with "an optimization we made for OS X." He added, "We'll get that fixed." In the meantime, there is a workaround, and oddly enough, it's described in an elderly Apple support document: Press Command-Option-I when inserting a DVD, and OS 9 will "try to make the disc available on the desktop as an ISO formatted disc instead of a UDF formatted disc." This worked for me, but it's of little comfort. DVD developers need the confidence that their discs will play anywhere, and the fact that iDVD 4 and DVD Studio Pro 4 discs won't play in OS 9 shakes that confidence. Here's hoping Apple fixes this problem soon. I'm eager to use DVD Studio Pro 3 for the DVDs that we produce here at Avondale Media, but, sigh, our titles need to be compatible with Mac OS 9 systems. Apple has shipped iTunes 4.6 -- you can get it through your Software Update system preference or by downloading it from Apple's Web site. The big news is iTunes 4.6 is support for the as-yet-unavailable AirPort Express base station. In iTunes 4.6, the preference tab formerly known as Effects is now called Audio. Click it, and you'll see a new option that enables iTunes to look for AirPort Express base stations. Apple says iTunes 4.6 has "other minor improvements," but at first glance, they aren't obvious. I did notice that the File menu command formerly known as "Publish Playlist to Music Store" now reads "Create an iMix." Minor indeed. Find something else of note? Let me know, and I'll share it here. Oh, and contrary to rumors, there is no liquid cooling in iTunes 4.6. The book, however, is red-hot. I got my first author's copy of The Macintosh iLife '04 yesterday, and it's a vision of beauty. I'll post some PDF and video excerpts soon. Searching for a way to unite your iTunes music library and your stereo? You're soaking in it -- air, that is. Today, Apple announced the AirPort Express base station, a $129 Wi-Fi base station that, at about 4 by 3 inches, isn't much bigger than an iPod power adaptor. Yet another base station? Not quite. The AirPort Express base station also contains a stereo audio output jack, and it works with a new version of iTunes (version 4.6, due later this week) to enable you to beam iTunes audio to a remote stereo or set of powered speakers. Apple calls it AirTunes, and at first glance, it looks like a versatile way to get your music from here to there. You can buy more than one AirPort Express base station, and Apple hopes that you will. Connect one to each stereo system or boombox in your house, and then use iTunes to aim your music appropriately. There are some downsides. The AirTunes signal is encyrpted for just one specific base station, so you can't "beam" your music to multiple base stations. If you have two stereo systems and two base stations, you can beam to only one at a time. Nor does it appear that you can "broadcast" other audio feeds -- for example, a streaming Internet station playing with RealNetworks' RealOne player -- to an AirPort Express base station. 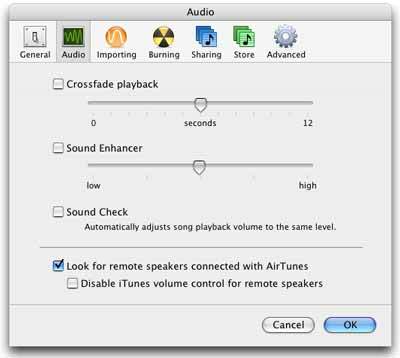 AirPort Express's audio features would be more useful if they enabled you to beam any Mac audio to your stereo, not just iTunes. But the biggest issue may be reliability. The spectrum used by Wi-Fi devices is a crowded neighborhood, and AirTunes may be prone to interference from everything from microwave ovens to cordless phones. Wired recently reviewed some Wi-Fi television sets, and found at least one of them prone to interference: "Because the TV's signals operate in the same frequency band as cordless phones, microwave ovens and other Wi-Fi products, during a Wired News test run it was impossible to receive uninterrupted video when these other devices were running. The video on the [Sharp] Aquos TV began fizzing out even though it was only 25 feet away from the base station." Will AirTunes have similar problems? We'll find out. In the meantime, there are other ways to unite a Mac and a distant stereo system. I've long been using the C. Crane FM transmitter to beam streaming Internet radio through my house. And an iPod remains the best way to listen to an iTunes library on your stereo -- you can switch tunes and playlists without having to walk over to your Mac. 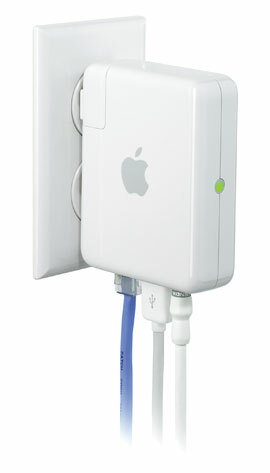 But AirPort Express and AirTunes provide yet another option. And keep in mind that AirPort Express is an AirPort base station, so you can use it to share a broadband connection and USB printer or to extend the range of an existing AirPort network. Very versatile. According to the Apple Store, the AirPort Express base station ships in the middle of July. iTunes 4.6 is due to arrive later this week. Also due this week... The latest edition of the only iLife book and instructional DVD combination ships this week. Pre-order The Macintosh iLife '04 for just $20.99. Greetings from San Francisco, where bride and I are still bopping our heads after a great night of music from Zero7, which we saw live at the Fillmore. What a great band -- rich orchestrations, great beats, superb vocals. I've been a fan for years and it was a real treat to see them live. Anyway, just a quick link today, this one to a feature that I wrote for a recent issue of Macworld. The feature is called From VHS to DVD, and it deals with an increasingly popular topic: capturing old movies into the Mac and burning them to DVD. I also cover this subject in detail in The Macintosh iLife '04 book and DVD, which still ship next week, according to Amazon. Pre-order your copy, then go listen to some Sophie Barker. Today, a random collection of audio oddities for your listening pleasure. Symphony #2 for Dot Matrix Printers. Via MacSlash by way of Leander Kahney's must-read Cult of Mac blog, a couple of thinkers different have composed and recorded a symphony of synchronized dot matrix printers. It can be yours at the iTunes Music Store. At this writing, track number 3, a three-minute, seven-second piece named %%%%%%%%$$$$$$$>>>>>>>>@@@@@@@, is the most popular download. It's no wonder. The sound of the universe. As Space.com reporter Leonard David reports, "An astronomer has turned observations of the early universe into a sound clip that represents a primal scream from the first million years after the Big Bang." The sound resembles a synthesizer's filter sweep. To quote the Space.com article, the sound "represents the first million years of the cosmos and it is compressed into about 5 seconds for easy listening." Listen now. This isn't the first time scientists have turned astronomical observations into audible sound. Also available for your listening pleasure is the music of the magnetosphere (more here). Last year, scientists determined that a black hole is producing a B-flat that's 57 octaves below middle-C. If anyone can tell me what this page is talking about, I'll sing the note for you. Big bong, indeed. There's a lovely collection of space sounds at -- where else? -- SpaceSounds.com. This University of Iowa site has more. Meanwhile, back on Earth. And finally, a friend replied to my post of May 12, in which I recommended RadioLovers.com, which contains hundreds of old radio programs. If you're into old radio, you should also know about Bill Sparks' amazing collection. The Old Time Radio WebRing should also be on your places-to-surf list. From the beginning of time to Fibber McGee and Molly to dot matrix symphonies, we aim to please here at macilife.com. If you please, pre-order The Macintosh iLife '04 at Amazon for $20.99. It ships next week!